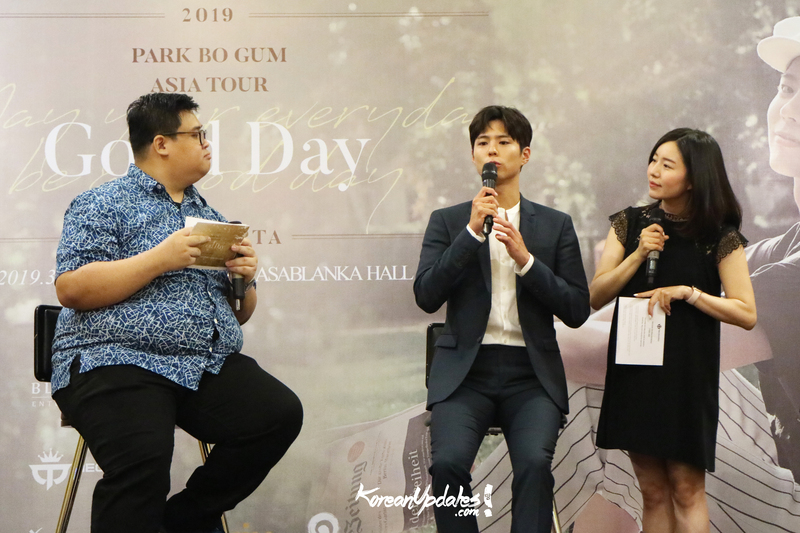 After the fan meeting titled “Oh My Day” in 2017, this time, actor from Blossom Entertainment, Park Bogum, came back to Indonesia for the third time in his second fan meeting entitled “Good Day”. This 25-year-old handsome actor will hold his fan meeting on Saturday, March 23, 2019 at The Kasablanka Hall. Before the event was held, Park Bogum first greeted the media in a press conference on March, 22, 2019. Here are the reports. How does it feel to come back to Indonesia for your 2nd fan meeting here? Park Bogum : I am very happy to be able to come back to Indonesia and meet all of you in my second fan meeting. You’ve been to Indonesia for 3 times already! is there any place in Indonesia that you would like really to visit? Park Bogum : Lombok and Bali. I have never been there at all. What do you miss the most about being in Indonesia? Park Bogum: Definitely the warm and hot atmosphere of the response from fans here. Because at that time you were singing with me. I am very happy. You’ve been in Indonesia for three times. Please tell us your favorite Indonesian food? Park Bogum: I like gado-gado . I like food in Vietnam and gado-gado is similar to one of the foods there. So I like it. Gado-gado is good, fried rice is also good, I like satay too. But I have never had oxtail soup. What is your most memorable impression about Indonesia fans? Park Bogum: Everything was impressive but in 2017 fans followed me singing “Untukku“. It was very impressive for me. Is there any difference in concept or theme on this second fan meeting? Park Bogum: During 2017 it was really a fan meeting but this time there was a little concert. Is there any special preparation for this fan meeting “Good Day in Jakarta”? Park Bogum: Yess, look forward for tomorrow..
Why is this fan meeting called “Good Day”? Please tell us the story behind the titled name! Park Bogum: So in 2017 the fan meeting titled “Oh Happy Day” means I hope for a happy day for all of you and this year entitled “Good Day” means I hope that those of you who come today or other days are a good day for you. You have recently finished your latest drama “Encounter”. Please share us your experience during the filming! Park Bogum: The thing that impressed me from the shooting of “Encounter” was that it was the first time for me to visit Cuba and it turned out that the Cuban people were very excited in his life and at first glance I remembered the fans in Indonesia, so I can’t wait for tomorrow’s event. You have played different character since you’ve been an actor. What is your favorite role so far? Park Bogum: Surely, if asked to choose one, it will be difficult because every role I play is very valuable and meaningful to me. Therefore I thought that maybe all of the roles I lived in were valuable. What is the most exciting part of being an actor? Is there any character or role that you want to try? Park Bogum: So when I play a role, I can feel the lives of others and that’s an interesting one. As an actor, I always have to learn something new. So, a feeling that I have never felt before, I can feel through this role and I understand that I will be like this. Maybe that’s why I’m grateful to be an actor. Many roles that I want to play, are there here who think “this role seems to be suitable for Park Bogum”? Park Bogum: So there is a new film, the title is “Seo Bok”. In the film I will play not as a human being, but I act as an AI (Artificial Intelligence). I think I can take on this role because with this role I can appreciate human life and what kind of fear people face. That’s what makes me curious. Since you have a very busy schedule, what do you like to do in your free time? Park Bogum: So fortunately, indeed I am very busy. Before the tour in Hong Kong I had time to spare by playing in the theme park and coming to the BTS concert. If there’s an empty time I don’t want that time to be wasted. What song do you often listen to? Why? Park Bogum: So I just released an album single in Japan. I am very grateful for that. Indeed this is my dream since childhood, but it can only be realized now. In my heart I grew up wanting to share my songs with fans and people in the world. Because, I want people to have hopes through my song. Park Bogum: That youth will not return for the second time. So as long as I’m young, I want to capture all of my work. What is your biggest dream in your life as an actor? Park Bogum: Of course I always want to be the best as an actor, for all of you. The more roles I play, the more difficult the challenges I will face. So I want people to look forward to my work. It is still a big task for me. What are you expected from tomorrow show? Park Bogum: Surely the support from Indonesian fans is so great. So through that I get extraordinary energy. I can’t wait for tomorrow. Please say a special message to Indonesia fans! Park Bogum: I am always grateful and thankful that I can be here again after two years. We’re living in different country that’s why I can’t come any time here. But Indonesian fans always come and search. It’s something extraordinary that you should be grateful for. Even though our language is different but this heart is still connected properly. The point is that tomorrow I will do my best for all of you so you pray for the best for tomorrow. Okay.. Dimana engkau berada disana ada cintaku. Terima kasih. Make sure you come and watch the show.. See you on second fan meeting “Good Day” Park Bogum In Jakarta..